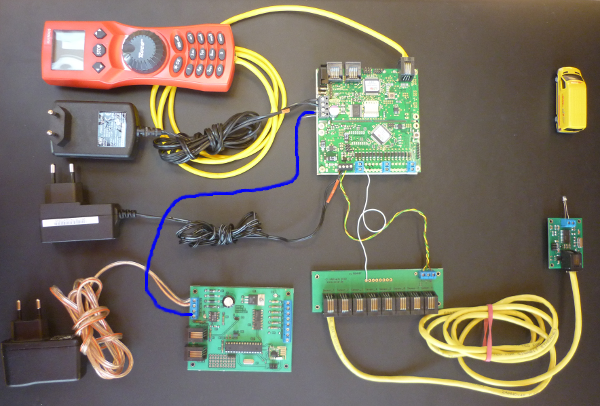 The Open Car System is a private open source project, which deals with the radio control of model cars according to the principle of the Faller Car System©. The control is with a digital DCC signal directly from the track by the BiDiB the modern model bus system, or even by a Xpressnet speed controller as an autonomous solution possible. 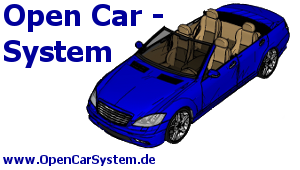 This system is somewhat comparable to the DC-CAR System designed by Claus Ilchmanns, as well as Karsten HANAFY infracar are two examples of this. 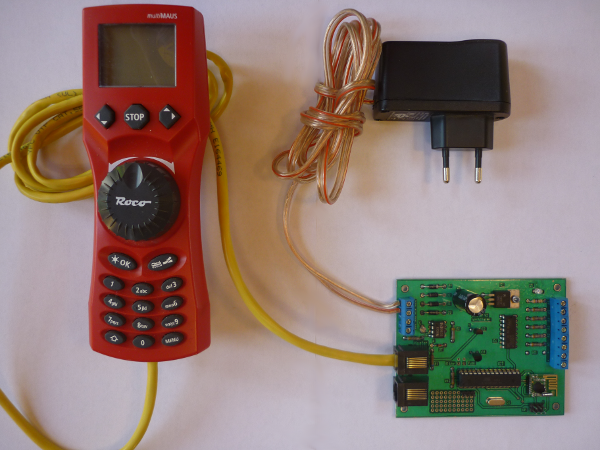 Also Faller © itself, offers two own digital control systems. But none of these systems has fully convinced us. Either it is the technique or the price for such a complete system not freely accessible system parameters are or but also very easy. That should change! This is the minimum version to control the OpenCarSystem. It consists of a booster V2, 15V AC adapter and a Roco of multi-touch mouse. At this point, is also a Roco of Lokmaus can mouse using II or a Lenz. Next follows separate control of vehicles and feedback on an existing GBM16T system. 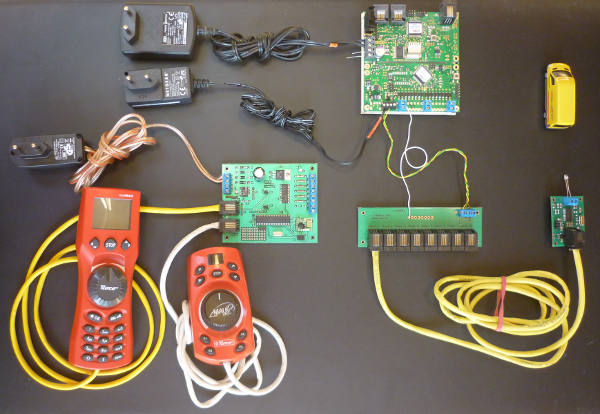 In the image to see separately again the Booster V2 this time with two mice of the locomotive, and a GBM16T with attached adaptor Board for 8 IR – back alarm sensors. An IR – sensor is connected in the picture right, it can register the vehicle address of the vehicle on a PC control back. Then, the next step is the booster V2 in the GBMboost / GBM16T systems. Here to see the image. The booster V2 is now controlled by the DCC track signal of GBMboost. This can get the digital information from a PC or from the in the image with the GBMboost connected Roco multi mouse. The feedback report of the vehicles is again transferring the IR – sensor to the GBM16T , it can forward it to the PC. At the end still an overview as the Booster V2 in a current OpenDCC BiDiB system can be incorporated. 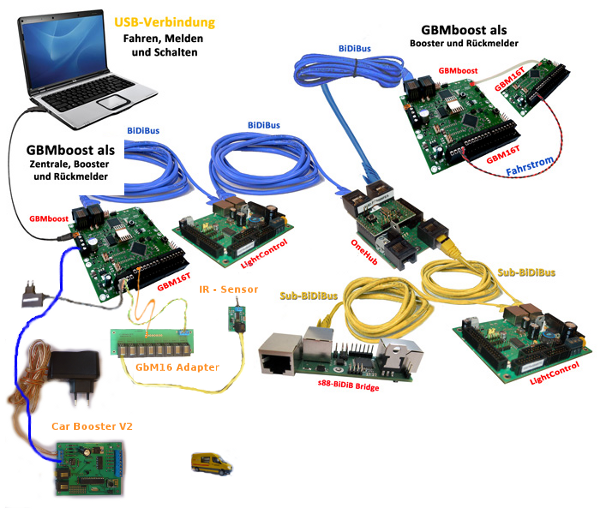 All of the modules connected to the BiDiB can be used to control the CarSystem. The LightControl is suitable, you can control switches many LEDs and 4 servo. It is also for the CarSystem a valuable system support.